Perfection produces large fruits. A hardy, ridge type cucumber the second most popular after Marketmore. Very easy to grow, perfect for outside growing. 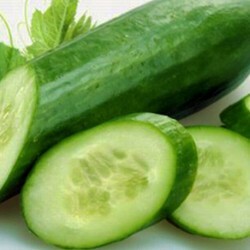 Cucumbers are an easy crop to grow and offer high yields making them one of the more popular crops in most home gardens. 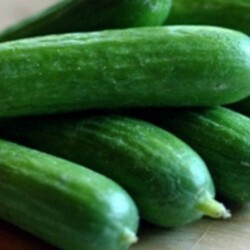 Cucumbers are grown for a variety of purposes from slicing to eat in salads to pickling to enjoy later. Cucumber seeds can be started indoors. This will allow you to have a healthy seedling ready to plant in your garden once the frost risk has passed as cucumbers are very sensitive to temperature change and frost damage. Cucumber seeds can be started indoors approximately threes weeks prior to the last frost date for your area. Plant your cucumber seeds in individual pots using a potting or seeding mix. Each pot should have two to three seeds in each pot, by placing multiple seeds in each pot you ensure success for each seedling you are planting (you can always remove the weaker plant once germination has taken place. Cucumber seeds germinate quickly, however you can help with this process by covering the pots with plastic to help keep the seeds warm, creating a mini greenhouse effect, however you need to remove this as soon as the plants begin to sprout. Cucumber seeds like a sunny spot however they also like to be warm so if possible try using a warming matt under your pots. You can also place your pots on top of the fridge to gain some heat as an alternative. Be sure to harden off your plants before moving them to the garden. You can do so by moving them outdoors each day for a few hours to expose the plants to cooler (but not cold) temperatures. When transferring seedlings to the garden, plant them a foot apart being careful not to disturb the roots. Adding a trellis to encourage the vines to grow up. This will protect your harvest from rot and pest. Should you choose to sow your seeds directly in the ground you will want to wait till all risk of frost has passed, about two weeks after the last frost date for your area, and the ground temperature should be 65 degrees. 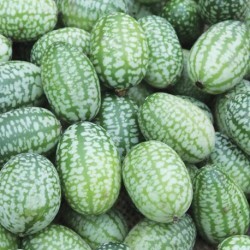 Cucumber seeds should be planted at a depth of one inch. Cucumbers can either be planted in rows with seeds planted approximately ten inches apart or in hills with two or three seeds being planted in each hill spacing your hills three feet apart. Cucumbers prefer a neutral pH soil, if you are unsure of your soil’s pH you can purchase a soil test kit. Your soil should be well drained and you add organic matter or manure to the area where you are planting your cucumbers to help with their success. Cucumbers need to be watered frequently, this ensures good tasting fruit. Always water at the base of the plant, avoiding the leaves (watering the leaves will encourage disease). Try to water in the morning whenever possible. Mulch can be added to the garden to help retain the water in the soil and decrease weed growth in the garden. Cucumber plants have both male and female flowers and both must be present for fruit to be produced. Cucumber plants are pollinated by bees, so it is a good idea to have other plants nearby that will attract bees and do not use pesticides and herbicides that will harm the bees. As your fruit ripens be sure to harvest it! 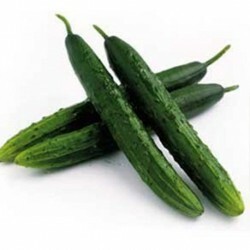 A cucumber is ready to harvest when it is green and firm. By harvesting your fruit, you will encourage your plants to keep producing more fruit. If you are overrun with cucumbers, share with your family and friends, they will be thankful! Companion planting is a method of planting that involves planting other plants close to one another to encourage changes in the soil or discourage pests. It is often used in vegetable gardening as an alternative to pesticides or in addition to them. Good plants to plant near cucumbers – peas, beets, radishes, beans, corn, carrots, dill, marigolds and sunflower. Plants to avoid planting near cucumbers – potatoes and sage.